KOKOMO, Ind. — Indiana University Kokomo Chancellor Susan Sciame-Giesecke honors two Chrysler Group LLC executives for their partnership with the campus, awarding them the Chancellor's Medallion. Chancellor Susan Sciame-Giesecke, Chrysler Group CEO Sergio Marchionne, and IU President Michael McRobbie chat during the Commencement Luncheon. See more pictures on Flickr. Brian Harlow, vice president and head of NAFTA powertrain operations, and global head of powertrain manufacturing engineering; and Brad Clark, general manager transmissions, received the awards Tuesday, May 13, at the Chancellor's Medallion luncheon, following Commencement. 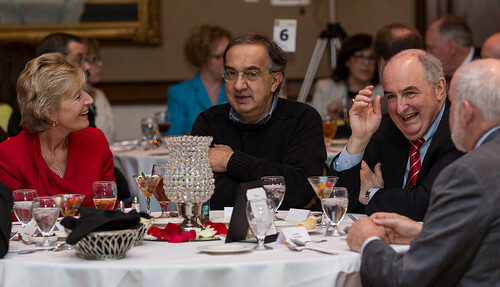 IU President Michael A. McRobbie and honorary degree recipient Sergio Marchionne, Chairman and CEO of Chrysler Group LLC., also were honored guests at the lunch, at the Casa Bella Ballroom. Other guests included John Applegate, executive vice president for university academic affairs, Kokomo Mayor Greg Goodnight, and many other local and state elected officials. Joanna Gonzalez, who began her current job with the Chrysler Group as an IU Kokomo intern, shared her story as an example of why Clark and Harlow received the awards. She earned a degree in health administration, and then enrolled in the Master of Business Administration program, planning a career in hospital administration. When she heard about the Chrysler internship program, which started in 2013, she saw it as an opportunity to grow her skills in a different way. "At first I thought, 'What could I possibly be doing in the manufacturing industry?'" Gonzalez said. "Then I realized I could still help people." As an intern, she helped start a professional development program, and translated documents from Spanish to English. The internship led to her current job as a full-time people development specialist. "I am thankful to IU Kokomo and Chrysler for making this possible for me," she said. "In the words of one of my wonderful colleagues, 'Take time to build someone else up, you all will soar.'" Sciame-Giesecke appreciates the open door Harlow and Clark have offered her, and the chances for both the Chrysler Group and IU Kokomo to benefit one another. Just recently, she said, company officials called her with a specific personnel need, and the campus referred several students who could potentially fill that job. "I look forward to continuing to partner and learn from one another in the future," she said. "Today is an excellent example of the kind of regional partnership President McRobbie envisions for IU's regional campuses." The Chancellor's Medallion is awarded to those who have provided exemplary service to IU Kokomo. It is created by Kokomo Opalescent Glass, from crimson-colored glass, etched with the image of the campus Well House.